Take Me Out To The Ballgame with Entertainment by Mark Sonder Productions, Inc. Performing in a stadium environment is not for everyone. It takes years of knowledge and experience to pull it off without a hitch. Mark Sonder, MM, CSEP and President of Mark Sonder Productions, Inc., the award winning national entertainment producer for large events is proud to announce that The Los Angeles Dodgers has asked his company to provide music and entertainment at Dodger Stadium commencing this Sunday, Father's Day, June 15th prior to the game vs. The Arizona Diamondbacks on this special promotional date where sports bags will be given out presented by Avita Water. 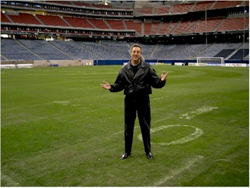 Super music agent Sonder, whose company has been engaged to perform in numerous stadiums across the country and as a featured speaker at the International Stadium Managers Conference has commented "Performing in a stadium environment is not for everyone. It takes years of knowledge and experience to pull it off without a hitch." Mark Sonder Productions, Inc. is no stranger to large events or to Los Angeles where just 3 weeks ago the company performed at L.A. LIVE, and in the past few months has worked: The Montage, Beverly Wilshire, The Westin Mission Hills Resort & Spa in Rancho Mirage and the Bighorn Golf Club in Palm Desert.